When something as big as content marketing comes along and transforms an entire discipline, it creates a lot of anxiety. Change is scary and it can sometimes feel like you’re hopelessly behind everyone else. At The B2B Huddle on May 2, 2013, held at Oracle’s UK headquarters, keynote speaker Doug Kessler shone a powerful spotlight on the future of B2B content marketing, offering compelling ideas and suggestions on what the future will look like - for content, and for content marketers. With references to his frank messaging in Crap: Why the Biggest Single Threat to Content Marketing is Content Marketing - a viral sensation across the social web with nearly 230,000 views on Slideshare - Doug offered Huddlers credible calls to action on the practical issues that concern B2B marketers, and discussed in the questions-and-answers session that followed his keynote. Doug Kessler is co-founder and creative director of Velocity Partners, the London-based B2B content marketing agency. Doug’s own content includes The B2B Marketing Manifesto (a rant), The Big Fat Content Marketing Strategy Checklist (a workbook), and Crap: Why the Biggest Threat to Content Marketing is Content Marketing. For social to become recognised by business as the next marketing powerhouse that it is, it needs to prove its return on investment every time, says Oracle’s Kimberley Brind. In this podcast of her keynote speech at The B2B Huddle on May 2, 2013, held at Oracle’s UK headquarters, Kimberley explains the reach and power that social is giving her company, and joins a vibrant question-and-answer discussion with the audience that followed her presentation. Kimberley Brind is Global Marketing Executive and Social Strategist, Oracle. She is an accomplished and pragmatic goal orientated Technology Marketer with an entrepreneurial approach and 20+ years international, strategic marketing, demand generation and marketing communications experience. Kimberley is responsible for social media marketing strategy and operations, inside sales demand generation programs, midmarket awareness and demand generation as well as preferred vendor management across Europe, Middle East & Africa. Connect with Kimberley on Twitter: @kimberleybrind. The rise of socially influential online content and individuals is transforming brand marketing. As trust declines in paid sources like celebrities and bloggers, it’s now mandatory to activate ‘everyday heroes’ who influence their networks about their passions. In his keynote presentation “From ‘Likes’ to Social Influence: How To Drive Action” at The Dell B2B Social Media Huddle in London on September 24, 2012, Andrew Grill, CEO of influence platform Kred explains influence marketing best practices that generate mentions and tangible, measurable results, and why influence now matters to consumers and brands. Following his keynote, Grill led discussion in a question-and-answer session with Huddle participants. A video of Grill delivering his keynote will be available soon, thanks to our friends at Present.me. Check The B2B Huddle website for information. Based in London, Andrew Grill is an experienced digital CEO, providing thought leadership and delivering strategic programs and new business across multiple industries. Currently, he is CEO of Kred, one of the leading online influence platforms. Andrew is able to deeply understand existing as well as new technologies and channels, explain them to clients, win business and provide strategic leadership. He is also an internationally-renowned keynote presenter in the field of digital and social media networks and presents at international conferences on a regular basis. A former resident of Sydney, Australia, since 2005 Andrew has been active in the European and US markets, and has a deep understanding of the digital, social networking and advertising space and is well connected to leading advertising agencies and brands in London and around the world. Connect with Andrew on Twitter at @AndrewGrill. Share your comments or questions about this podcast, or suggestions for future shows, in the FIR FriendFeed Room. You can also email us at ; call the Comment Line at +1 206 222 2803 (North America), +44 20 3239 9082 (Europe), or Skype: fircomments; comment at Twitter: twitter.com/FIRpodcast. You can email your comments, questions and suggestions as MP3 file attachments, if you wish (max. 3 minutes / 5Mb attachment, please!). We’ll be happy to see how we can include your audio contribution in a show. This FIR Speakers & Speeches podcast is brought to you with Lawrence Ragan Communications, serving communicators worldwide for 35 years. Information: www.ragan.com. While social business design is much discussed, we struggle when it comes to bringing about wholesale change in an organization. Perhaps it is because we are trying to describe these new opportunities in business language that is outmoded and inappropriate. You’ll get extra benefit from Mayfield’s keynote if you view his presentation deck as you listen, embedded below (if you don’t see it, view it at Slideshare). A video of Mayfield delivering his keynote will be available soon, thanks to our friends at Present.me. Check The B2B Huddle website for information. Antony Mayfield is Founding Partner at Brilliant Noise, a strategic digital agency. He is the author of the best-selling book on how to manage personal reputation online, Me and My Web Shadow, which has been published in several countries by Bloomsbury. He has also written a number of e-books, the most well-known of which, What is Social Media?, has been downloaded tens of thousands of times, placed on reading lists for top business schools and translated into Chinese. In 2006, he founded the content and social media teams at iCrossing, which became the largest independent digital marketing firm in the world, before being sold to Hearst Media in 2010. Prior to iCrossing, Antony spent a decade in journalism and corporate communications, most recently as a director in the Bell Pottinger Group. Antony is a Fellow of the Royal Society of Arts and a committed advocate of spreading digital literacy - knowledge and skills about how to use the internet better - in businesses and in wider society. Connect with Antony on Twitter at @amayfield. The web is quietly, but quickly, undergoing a social revolution, blending the analogue and digital worlds to become even more powerful in the way we all live, work and play. That’s a core premise that Dave Coplin, Director of Search UK at Microsoft, shared with participants of The Dell B2B Social Media Huddle in his keynote presentation in London on September 24, 2012. Search is at the very heart of this change as the internet evolves to be more about "doing" and less about "finding," Coplin says. Understanding this change is crucial, not just for the satisfaction and welfare of consumers and customers, but equally for the success and relevance of businesses and brands. Coplin’s presentation highlighted the challenges (and opportunities) faced by us all as we move to this new way of living and working, and how shifting to a more human approach that enables us to unlock the full potential of all that technology has to offer a modern society. A video of Coplin delivering his keynote will be available soon, thanks to our friends at Present.me. Check The B2B Huddle website for information. Since joining Microsoft in 2005, Dave Coplin has worked across a wide range of sectors and customers, providing strategic advice and guidance around the cost effective use of technology in relation to their business needs. As an established thought leader in the UK and having spent a considerable amount of time in the public sector providing leadership and guidance around key technology issues like Cloud Computing, Open Government, Open Data, Social Media and the “consumerisation” of IT, Dave is currently working as the Chief Envisioning Officer for Bing in the UK, focusing the spotlight on the power and potential of search and the way it holds the key to society’s effective use of all that technology and the internet has to offer. Connect with Dave on Twitter @dcoplin and at his on-line home www.theenvisioners.com. 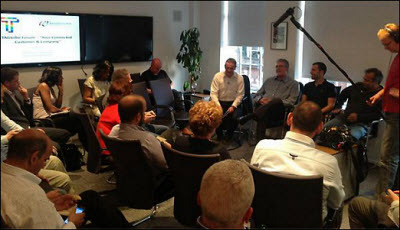 Conversations instead of pitching, connections instead of leads; permission over advertising, engagement over spam and goals rather than targets - strong sentiments that characterized a lively discussion at Waggener Edstrom in London on September 5, 2012. FIR co-host Neville Hobson joined fellow panelists JP Rangaswami, Chief Scientist at Salesforce.com, and Jon Silk, Head of Digital at Waggener Edstrom London, in a wide-ranging Q&A discussion moderated by Andy Bargery, Director at Klaxon Marketing, that addressed the broad topic of "your connected customer and company." Following the panel Q&A, the floor opened out to include the audience, making for an engaging hour of discussion and debate where everyone with an idea, an opinion or a comment could contribute to and enrich the overall conversation. The event was organized by Bernie J Mitchell for the #TAGtribe Forum events series. A special thanks to Andrew Halley for recording the event and whose audio forms this podcast. Picture above courtesy of Waggener Edstrom London. On June 27, 2012, FIR co-host Shel Holtz delivered a closing-day presentation on the real meaning for communicators of the shift to mobile and the related issue of games and gamification. While many communicators aren’t even thinking yet about mobile (at an earlier conference session, someone argued that mobile is a consideration for IT and HR, not communications), others are focused on deploying apps and optimizing their existing websites for smaller screens. The issues are deeper, however. They range from the way people use these devices—not the same way they use computers—to some of the technologies (like QR codes and Augmented Reality) that will drive more and more usage in the future. There’s also content to consider: Will people get it from traditional channels on smaller devices, newer tools like Flipboard, or tools that have not yet emerged? The PowerPoint deck is available below as a Slidecast presentation, so all you have to do is click the play button and the audio will play in sync with the slides. The audio will stand alone, too, if you prefer to listen on the treadmill or out on your walk with the dog. Podsafe outro music - extract from On A Podcast Instrumental Mix (MP3, 5Mb) by Cruisebox.